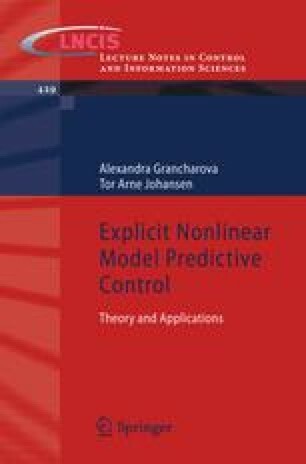 This chapter considers two approaches to explicit min-max NMPC of general constrained nonlinear discrete-time systems in the presence of bounded disturbances and/or parameter uncertainties. The approach in Section 6.2 is based on an open-loop min-max NMPC formulation and constructs a piecewise linear (PWL) approximation of the optimal solution. An explicit open-loop min-max NMPC controller is designed for a continuous stirred tank reactor, whose heat transfer coefficient is an uncertain parameter. The approach in Section 6.3 adopts a closed-loop (also referred to as feedback) min-max NMPC formulation and builds a piecewise nonlinear (PWNL) approximation of the optimal sequence of feedback control policies. The approach is applied to design an explicit feedback min-max NMPC controller for a cart and spring system in the presence of bounded disturbances.